This deal has actually been SUPER popular the last few days! 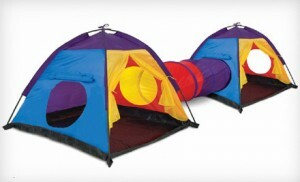 Get a Discovery Kids Double-Dome Play Tent with Tunnel for only $24 + $3 shipping. That's only $27 SHIPPED when the original list price is $50. Shop Discovery Kids Play Tent!